During his first Monday press conference of the season, Coach Mike Riley announced which true freshmen were in line to play this season. Linebacker Avery Roberts enrolled early and won the back-up inside linebacker spot behind Chris Weber during spring ball. Tyjon Lindsey dazzled with his speed for a banged-up wide receiver corps. Deontre Thomas earned some first-team reps at nose tackle during fall camp and is listed as the back-up. All three of these players have fairly defined roles. The fourth player Riley highlighted? Running back Jaylin Bradley, a local product out of Bellevue West High School. Bradley was listed as fourth on the depth chart behind listed co-starters Tre Bryant, Mikale Wilbon and Devine Ozigbo, and walk-ons Austin Rose and Wyatt Mazour also could be options in the backfield. Because of the depth in the backfield, Riley guaranteeing that Bradley will play this season might have caught some off-guard. It wasn’t a surprise to Bradley’s high school coach Mike Huffman, though. “Why they choose to do this I don’t have an answer but they’ve really kept me in the loop the whole time,” Huffman said. According to Huffman, Riley called him before the start of fall camp to tell him how well Bradley had done over the summer and how he was in the mix. Huffman said that Bradley’s package of plays on offense expanded throughout fall camp, and the coaches knew early on that he would have a chance to contribute this year. Bradley still has three upperclassmen ahead of him in juniors Wilbon and Ozigbo and sophomore Bryant. His role on offense is still yet to be determined. However, the coaches want to give him a chance. This is somewhat of a new experience for Huffman as well as most of the players his program has pumped out recently — such as receivers CJ (Wyoming) and Cade (South Dakota State) Johnson, the sons of former Husker Clester Johnson — redshirted during their first years in college. Bradley stepped in when the starting running back suffered an injury or cramp, and the Thunderbirds “just never looked back,” according to Huffman. Bradley went on to be the workhorse back the rest of his career and was incredibly productive. Now, he is going to have to bide his time again and wait for his turn. However, he won’t have to wait very long to see the field in another phase of the game. Bradley is listed as the third-string kick returner. “We certainly feel good about the abilities of those guys. [J.D.] Spielman, Lindsey and Bradley, they all have ability,” Riley said. “They all have the ability to run in space and create something special. They all have that … We’ve been really impressed with the ability that Jaylin Bradley has shown as a runner, as a receiver and playing on special teams. He’s playing on other teams besides the return teams, too. We’re excited about him as a football player, so we feel good about putting him in. Spielman will be the primary returner and is set on holding onto that role, and Bradley may not get a chance to return many kicks. But no matter what else happens on offense or kick returns, Bradley will get every chance to make an impact on the coverage teams for punts and kickoffs. In fact, Bradley just had to change his number from 5 to 33 — the number Clester Johnson wore at Nebraska — so that he could play on the same unit as linebacker Dedrick Young II. The coaches have raved about Bradley’s athleticism any time they’ve been asked about him, and despite being a star on offense for his high school team, special teams are not anything new for the 6-foot, 180-pound back. 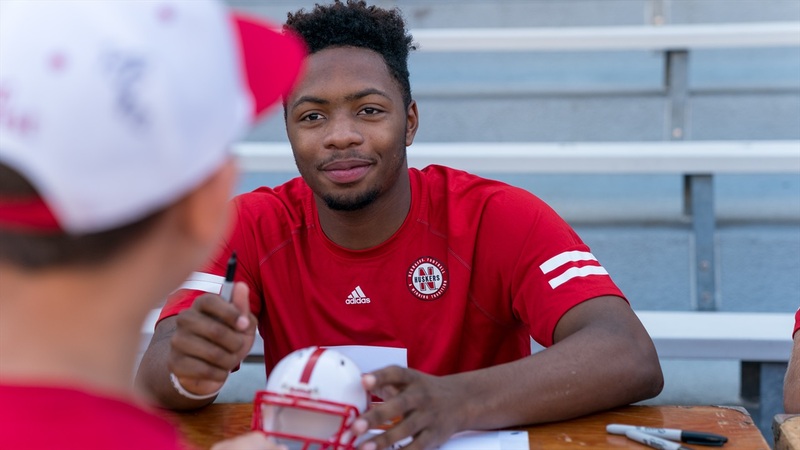 Bradley was one of the last players to join the class of 2017 for the Huskers, but he’ll be among the first to make an impact for the Huskers and his experience in high school should have him well-prepared to fill any role the coaches ask of him.